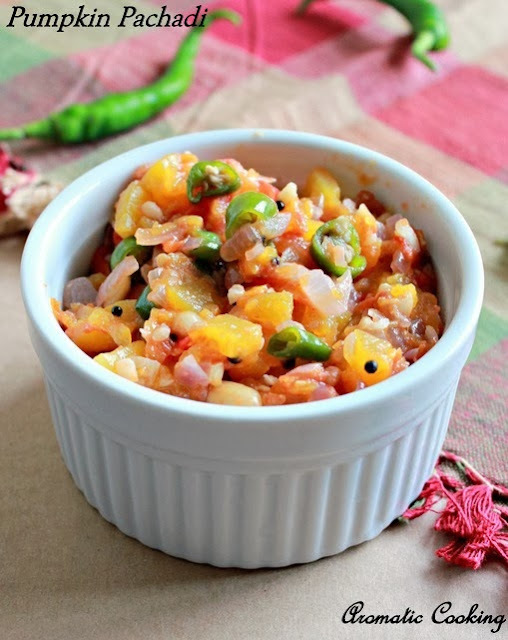 I was putting together lunch on a weekend, I had only a few veggies in hand and I didn't want to get new ones before getting done with them, I had made a sambar and a fry and I had some chopped pumpkin in my freezer which I wanted to finish up. Usually I make a sambar or a curry with it, which I didn't want to do that day, so I made this pachadi for the first time. 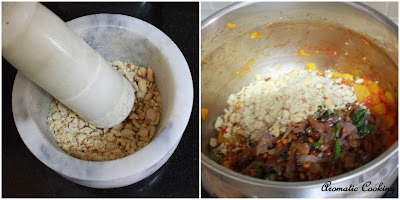 It turned out to be very good, served it as a side dish, but even tasted great when mixed with some rice..
Roast and coarsely pound the peanuts. 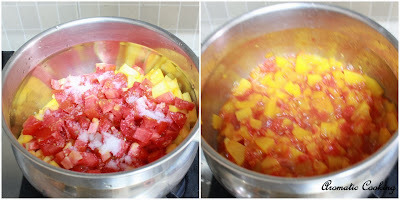 Cook the pumpkin and the tomatoes with some salt till they become soft. Heat oil, add the urad dal, mustard and fenugreek seeds, once the spluttering stops, add the asafoetida, curry leaves, green chillis and onion, saute well till the onions turn transparent. Roast and coarsely pound the peanuts. Add the peanuts and the sauteed onion mixture to the cooked pumpkin, add the lemon juice, mix and serve. to Spicy Treats for the Show Me Your Hits - Healthy Delights event. The tomatoes I get here are not very sour, if you are using the sour tomatoes that we get in India, use less. 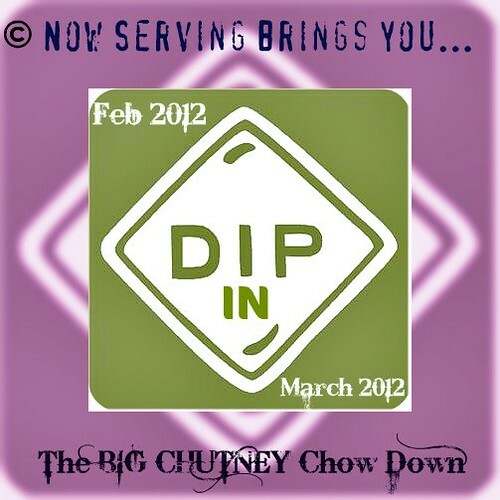 very interesting and yummy one...nice idea Hema! 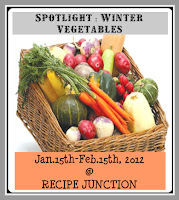 Thanks for linking to the event..
Super and delicious one !! healthy and nice colour pachadi! Oh wow..love this..so new to me and that gorgeous colour is really inviting. A different way of pachadi, i regularly use carrots for this. Looks colorful too. Hema, this sounds so easy. Bookmarked. easy and flavourful pachadi !!! I love pumpkin pachadi.....looks yummy. Happy to follow you too. Lovely lovely lovely!!! thanks for the entry - will surely try this out soon! 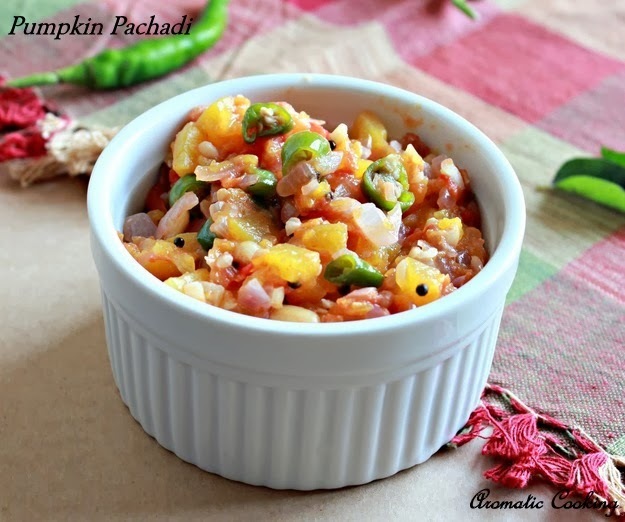 Very lovely idea of making pumpkin pachadi! !